TARQ and Papernautic are delighted to announce an origami and paper sculpture workshop that ties into the gallery's ongoing exhibition Concrete Ciphers by Pratap Morey. Ever doodled an impossible building when you were younger? Who doesn't like toy houses, castles, or secret lairs from the future? Let's bring them to life. 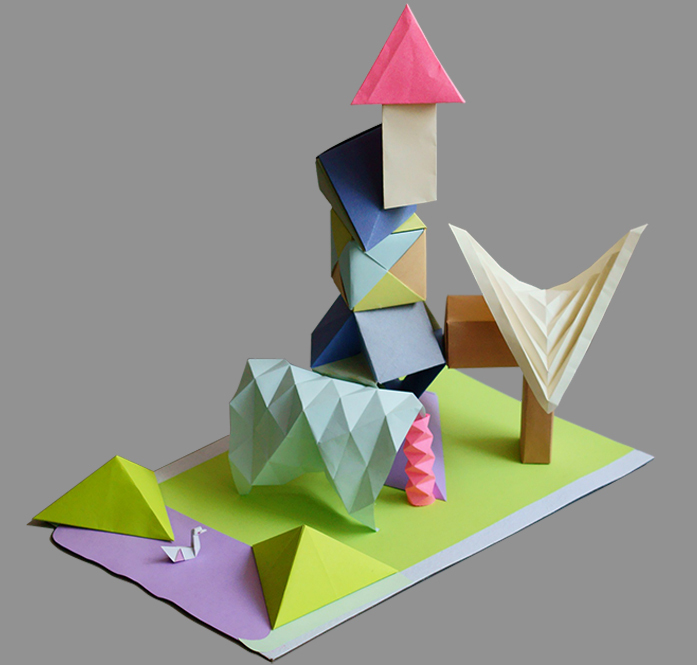 This workshop will be a fun and educational exploration of the art of modular origami and folded paper models built from smaller assembled elements. Samir Bharadwaj will introduce the basics of origami built from simple modules, and will guide you through learning more complex designs which can be used to craft models of imaginary buildings. By the end of this workshop participants will gain a good understanding of some basic techniques and patterns in modular origami and the confidence to continue experimenting with assembling paper sculpture creations of their own. Each participant will receive a take-home kit of materials and instructions. Copyright © *|2018|* *|TARQ|*, All rights reserved.